Apple Cider = the taste of fall. Autumn is one of the most delightful times to visit Michigan farms. Hay rides, pumpkin patches, and corn mazes are fun no matter how old you are – five or fifty. Harvest festivals abound at this time of year, and guests of our Eaton Rapids inn enjoy them. Uncle John’s Cider Mill is about forty five minutes north of our Southern Michigan inn. The historic Cider Mill, used as a Cattle Barn in the early 1900’s, features a Cider Press, Donut Shop, and seating area. 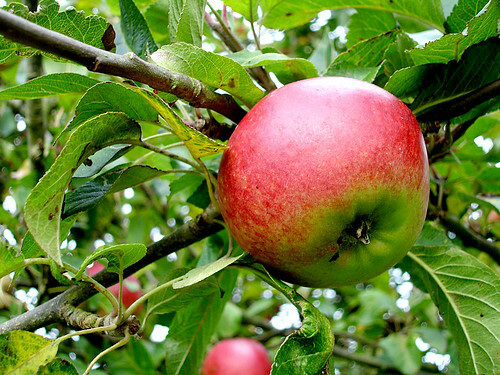 In September and October, visitors may witness the pressing of the cider (typically on Tuesdays, Thursdays, Saturdays and Sundays). Enjoy fresh or mulled cider or try Uncle John’s award winning Hard Apple Cider. All taste like fall. In addition to cider, Uncle John’s makes wine. This Michigan winery is housed in a 1918 building originally used to store and package the fresh fruit grown at the farm. Today it is the winery and tasting room. Wine tasting is available Monday through Saturday from 11 a.m. to 7 p.m. and Sundays from 12 p.m. to 7 p.m.. The winery closes at 6 p.m. in November and December. Harvest time is cause for celebration, and in addition to wine and cider tasting, hay rides, and the like, there is live music. From 1 p.m. to 5 p.m. on Saturdays and Sundays through October, enjoy bands like Conchord and The Phantom Shakers. For a complete list of events and directions, please visit Uncle John’s website. After a day of fresh air and activity, it will be a relief to return to our luxurious bed and breakfast overlooking the Grand River. Unwind in our pub or enjoy a more formal meal in our DiRoNA restaurant, and toast the fall harvest.